To keep Summit from overheating, more than 4,000 gallons of water pump through its cooling system every minute, according to Oak Ridge National Laboratory where the beast is housed. It's shiny, fast and ultrapowerful. But it's not the latest Alpha Romeo. 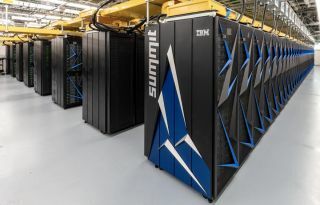 A physics laboratory in Tennessee just unveiled Summit, likely to be named the world's speediest and smartest supercomputer. Perhaps most exciting for the U.S.? It's faster than China's. The supercomputer — which fills a server room the size of two tennis courts — can spit out answers to 200 quadrillion (or 200 with 15 zeros) calculations per second, or 200 petaflops, according to Oak Ridge National Laboratory, where the supercomputer resides. "If every person on Earth completed one calculation per second, it would take the world population 305 days to do what Summit can do in 1 second," according to an ORNL statement. The former "world's fastest supercomputer," called Sunway TaihuLight, can perform 93 quadrillion calculations a second (93 petaflops), while humming away inside China's National Supercomputing Center in Wuxi. So, how did Summit become such a giant? The supercomputer is an IBM AC922 system that's made up of 4,608 computer servers — each comprising processors (the brains of the computer). But what's actually going on inside these processors is what makes the difference. "Summit's computer architecture is quite different from what we have had before," Daniel Jacobson, a computational biologist at ORNL, who is working on Summit, told Live Science. For one thing, the computer uses the new Tensor Core feature in its graphics cards (made by Nvidia), which is designed specifically for applications focusing on machine learning and artificial intelligence (AI), and to be fast. Basically, unlike older computer chips, these chips are optimized for a special type of mathematical operation on matrices — or rectangles filled with numbers with rules for adding, subtracting and multiplying the different rows and columns. Computers equipped with AI programs often learn using so-called neural networks, which have several layers in which lower calculations feed into higher ones. And this process requires the heavy use of matrices. "This is a brand-new feature that has allowed us to break the exascale barrier," Jacobson said, referring to a processing speed that's over a billion billion calculations per second. In addition, Summit has loads of superfast memory (RAM) available on each of its nodes, where localized calculations can take place. "Each node on Summit has 512 Gb [gigabytes] of RAM and the network that communicates between nodes uses adaptive routing, and is thus incredibly fast, which helps us scale the calculation across all the nodes very efficiently," Jacobson said. So-called adaptive routing means Summit has some flexibility in how it runs calculations — sort of like networks of brain cells connected to synapses. And though pricey — a New York Times report puts the cost at $200 million — Summit could deliver big for science: The supercomputer is built to integrate artificial intelligence into its computing, which could make Summit a formidable foe in the battle for answers to some of the world's most complex mysteries. "There are many, many scientific uses of this sort of supercomputing capacity," he said. "Whether this is for new discoveries for bioenergy or new discoveries for precision medicine, many things are now possible that simply weren't before." For instance, just as artificial intelligence programs are being co-opted to learn to pick out cats from images, said Jack Wells, the director of science at ORNL, these AI programs running on Summit could learn to pick out and categorize all kinds of data, ranging from those in biological sciences to physics, such as detections of neutrinos and other particles. "Something new that's happening, is it's going to be at the intersection of machine learning and simulation science, because this machine is going to be able to do both of those things in a very significant way," Wells told Live Science. Summit's placement as the "world's fastest" isn't exactly official yet, because the Top500 list for supercomputer rankings hasn't been updated yet, but according to the Times article, it should get the top slot when the list is updated later this month. Editor's Note: This article was updated to correct the speed of the former "world's fastest supercomputer."